David Buchanan is looking forward to stepping out on home soil again and also stepping things up as the Cobblers continue their pre-season preparations with a clash against National League side Barnet on Tuesday night (ko 7.45pm). After a trio of friendlies at non-League sides Sileby Rangers, St Albans City and Brackley Town as well as the clash with Hull City Under-23s in Spain last week, Town finally step out at the PTS Academy Stadium, with the Bees clash followed by a date against a Manchester United XI on Friday night. 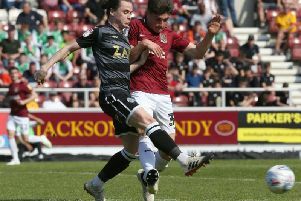 It has been a very successful pre-season to date for the Cobblers, with all the matches won and virtually no injuries sustained, and Buchanan is now focusing on stepping things up a little more ahead of their August 4 opener against Lincoln City. “It will be nice to get back to Sixfields for the first time in pre-season, and I think it’s important we start to get more minutes under our belts,” said the left-back. The disappointment of relegation back in May was tough to take for Buchanan and his Town squad-mates, but the player insists he and his team-mates are only looking forward, with a successful league two season now the only thing on their minds. “It has come around quick, and I can’t wait for the season to start,” said the former Preston North End man. “I think Lincoln are going to be really strong, and they have recruited well in the summer. “Since the manager has gone in there, they have only gone in one direction, and it is going to be a very tough game. “But what I always say is we have got a good squad as well, and they are coming to our place on the first day of the season. If Town are to have a successful season, then they are going to have to fully utilise what is still a big squad, and Buchanan believes the signs in pre-season have been good. “Strength in depth is a major thing, and you need every player over the course of the season to contribute,” said the 32-year-old. “The game against Hull last week was a good exercise, we got asked a few questions and went 1-0 down, but we ended up winning 3-1, and it’s all about winning no matter who you play against. A veteran of many years as a professional player having started out at Bury in 2005, Buchanan has been through many a pre-season, and believes the modern trend for clubs travelling abroad for training camps is a positive one. “I can remember my first pre-season like it was yesterday, although it seems a long time ago now,” said Buchanan. “It has changed though, because when I first started we never had these trips away or anything like that. “Now, at every level, it is part of the game because the staff and managers want to get the squad integrated really quickly and build up friendships. And he added: “The week in Spain was really good from start to finish, and really well organised by the staff and coaches. “The players knuckled down and worked hard and did everything that was asked of them. “It’s been good for the young lads to be part of it, and I think the new lads in the squad have integrated well.